Disclosure: Thanks to Miller Boat Line for providing my family with a trip to Put-in-Bay on their ferry to the island. All opinions are honest, my own, and may differ from yours. If you are looking for a great getaway for your family, Put-in-Bay, OH is the place to be! I have lived in Ohio my entire life and had never been to Put-in-Bay until last week! I was sure missing out. I’d always see cars with PIB decals on them, and I’d think how much fun it would be to visit. When Miller Boat Line contacted me with an offer to ride their ferry to the island, I was more than happy to say yes! Miller Boat Line takes passengers and vehicles to Put-in-Bay and also to Middle Bass Island. The trip to Put-in-Bay from Catawba takes about 20 minutes and is a very smooth ride. My kids, my parents and I really liked being on the ferry and seeing the lake! Lake Erie really is beautiful to look at and seeing the islands in the distance makes you really excited to get there! 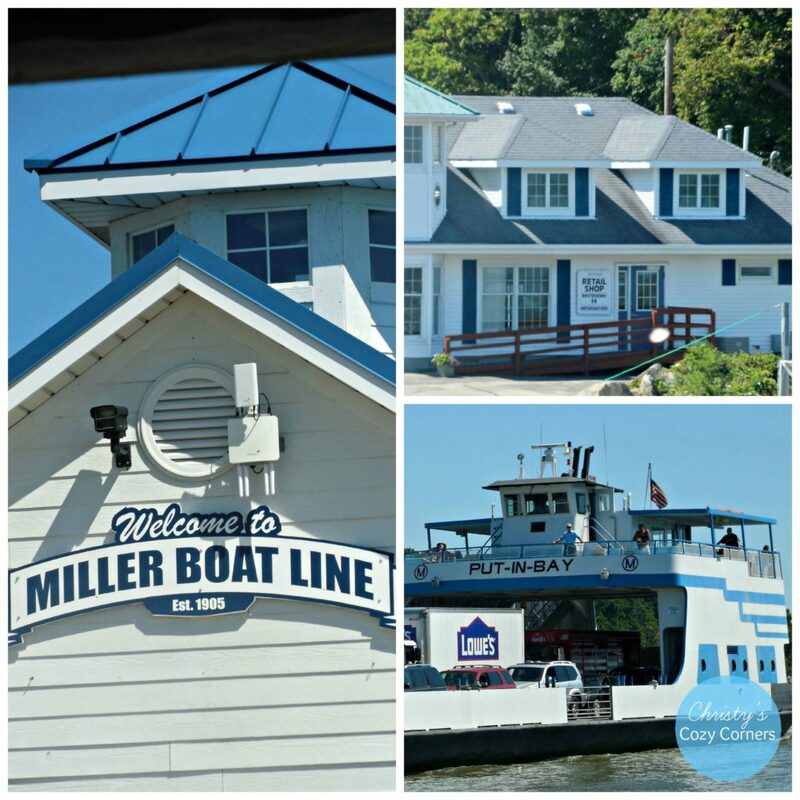 Miller Boat Line has a long history and has been in existence in some way since 1905! If you are a history buff, you can read about the history of Miller Boat Line on the website. It is really interesting! The ferries leave about every half hour from Catawba to Put-in-Bay and back from Put-in-Bay to Catawba. It is so convenient and easy to board as a passenger! I am not sure about taking your vehicle (which costs $15 one way), but I would recommend getting there early. Adults and children 12 and up can ride for $7 one way while children 6-11 ride for $1.50 one way. Kids under 6 ride for free! You can also take bikes over on the ferry for an extra $2. Biking is a great way to get around the island. Unless you live on the island for the season, or you really need your car for some reason, I recommend you leave your car in the parking lot and rent a golf cart while on the island. It is the way to get around. Golf carts are everywhere! We were provided one for the day free from E’s Golf Carts. Thank you, E’s! It took me a little while to get used to it since it is silent while idling (I thought it was out of gas! ), but you just put your foot on the gas and go! E’s offers the lowest rates on the island! The rates are seasonal, so check the website for details. We had such a great time on Put-in-Bay, thanks to Miller Boat Line! They set us up with tickets to Perry’s Family Fun Center as well, and we had a great time! 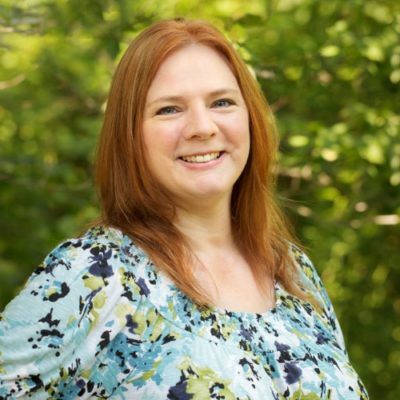 You can read about our Perry’s Cave, Put-in-Bay fun, and Nature and Wildlife Center adventures too! Check out the Put-in-Bay events page on the Miller Boat Line site to see what is going on on Put-in-Bay and plan your trip! If you are traveling with little ones, be sure to check out their Put-in-Bay kids page where you can find discounts, see the attractions available to visit and print out coloring pages! Follow Miller Boat Line on Social Media to keep up with the latest news and events! OMG, it’s so beautiful there! For me, there’s really nothing more fun than a ferry ride. Put In Bay looks like a fantastic place to hang out. We took a trip on a ferry with the kids once. I’ve never seen them so excited. They were enamored with the fact that it was the only way to get where we were going. That is so cute! It is pretty cool that a boat is the only way to get someplace…or a private plane lol. What a beautiful little island. I love that they have a ferry and you can bike around the island as well as golf cart. On my bucket list. It is such a fun experience! You’ll love it! Wow, what a beautiful looking island. I’ve never been to anything quite as beautiful before but would love to someday. Looks so lovely and like a wonderful little trip to make! Wow, look how gorgeous it is there. The view reminds me of my hometown back in the Philippines. Thanks for sharing. Thank you! It really is so pretty! That ferry ride looks like a lot of fun. I’ve been to Lake Erie on the Canadian side and yes, it’s a lovely lake. I’m sure you had an amazing time. We were only 3 miles from Canada! I told my kids we should have told them to take us over lol. I had my very first ferry ride this past week between St. Maarten and Anguilla. It was so much fun. Looks like you all are having such a good time! Ohhhh nice! I bet that was a beautiful trip! This looks like such a fun time! I love riding ferry boats and I had no idea this was in Ohio! I’d love to check it out. Yes, it is close to Port Clinton! How much fun and that is an adorable ferry! 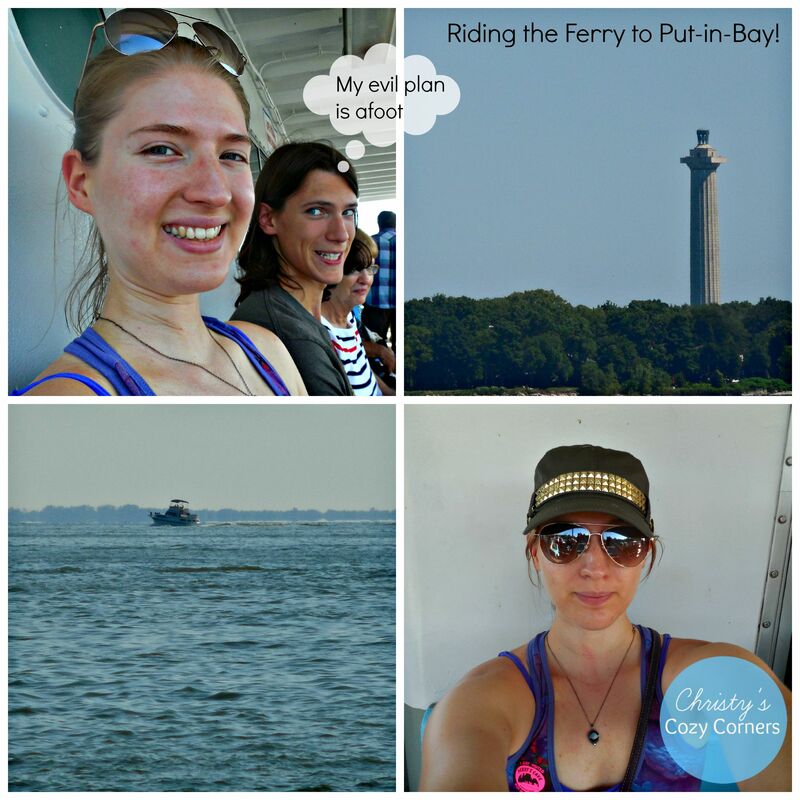 We go once a year and do a ferry ride where we live and it’s so much fun! Ferry rides are great because you don’t get seasick lol. Oh I’d love to try this some day. Taking the ferry and then traveling by Golf cart would be great. What a great trip, I’ve only been on a boat a few times. I love the idea of leaving your car and renting a golf cart to get around. Golf carts make everything fun. They do! Especially when almost everyone there is driving one! fun ride.. never been to ferry.. This seems like such a fun thing to do! What better way to spend quality time with friends and family too! I agree! I love that my parents are still able to do things like this with us. What a beautiful little island. The view is simply amazing. I would love to visit this someday. It looks like you had a great time. I love island hopping, there is nothing as fun as the feel of the wind, the sun, and the vast body of water as you ride the ferry. So many sights to enjoy. Thanks for sharing. I would love to live closer, so we could go really often. It was so fun! How beautiful was your trip! I have on my visionboard island hopping so you inspired me even more! I would love to just go all over to all of the islands too! I’ve always wanted to ride on a Ferry. It looks like so much fun. Looks like a great island to visit…I love ferry rides..there’s something so relaxing about them! Yes, it is nice and relaxing with the wind blowing on your face. I’ll check out E’s for the golf cart when I go to visit my mom. I’d love to head back to the island, I haven’t been since school! I do remember the cave though, with the crystals. That was so cool it left an impact. I remember renting bikes too, tandem if I’m not mistaken. We had a blast! I would love to live close and go all season long! I wish we lived closer to the water, but we are over an hour and some change away. It looks like everyone had a fun day! We are too! I would love to be closer! I wish I lived close too! This looks like so much fun. I have not had the chance to rude a ferry. I wish I lived somewhere that had ferry rides like this. I have never been on one before. I’ve been a few times, and they are really nice! I would love to take a ride on a fun ferry on the water. I need to enjoy summer more with trips like this. It is really great to get away for a day. Put-in-Bay sounds amazing indeed and it looks like you were having fun. I would love to visit the island some day. The ferry sounds like it would be fun in its self to ride. Thanks for sharing. You’re welcome! It was very nice! It looks beautiful there! I would love to take a ferry one day. I live in MI and Put-in-Bay, OH isn’t very far from us. We were looking at heading down there before summer is over for a few days. Sounds like a really great time. You should! It is fun! I was just telling my hubby today that our family should do something like this. Thanks for sharing your fun experience. You’re welcome! I hope you get to go! Oh this looks like a great adventure. It’s been a while since I rode a ferry but we have a family trip coming up in October and we’ll be traveling by ferry during out stay. This is so, so, so beautiful and looks like such a good and relaxing trip.